This entry was posted in Books, Just for Fun, Monsters, Movies, Popular Culture, Posts and tagged Ghost Hunters, ghosts, Halloween, horror films, John Carpenter, TAPS by Steve Wiggins. Bookmark the permalink. Thank you for making us aware of this interesting article from a source that might not be readily available. I have long argued for the connection between the sacred and horror, even from a Christian perspective. You can read several posts on this on my blog TheoFantastique at http://www.theofantastique.com, and can also find my interviews with Douglas Cowan on his books Sacred Terror and Sacred Space. The sacred and the scared are themes I turn to often. I’ve added a link to your site — looks great! Monstertalk features a lot of local legends. These podcasts are very interesting for the non US citizen to familiarise themselves with Fox Mulder’s pet peeves amongst other horrors. I love the way you guys still cling so dearly to bigfoot. Thanks very much for talking about me on your blog. I really appreciate your comments. As you pointed out, TAPS is a fanzine and it is difficult to have a full, long drawn out discussion on the nature of horror along with the religious connections. I had 1400 words and I had to condense a lot of my thoughts on the subject into that space. Your point about fear is a good one and should be addressed. However, that wasn’t really the intent of my article. Rather, I meant it to be a short argument on why religious people can not only watch horror, but really learn to appreciate it. As a minister who just published a ghost story, I have gotten (as you might imagine) a ton of questions on the subject. I tried to address them as much as I could in a short amount of time. It is certainly a subject that deserves way more attention. That is why John’s blog is so fantastic. Thanks again for the mention, I really do appreciate it. Thanks for stopping by! I appreciated your article, and I am well aware of word-limits and what they can do to a thought (or many thoughts). I am interested in your point-of-view. I taught for many years in a seminary that was rife with ghost stories, and I could never make up my mind about them. I am also an inveterate fan of horror films, going back to my own seminary days. I was interested to see that the TAPS crowd had found you — I know when the series started out they had quite a few episodes with a more religious bent. Now that the SyFy series has gone mainstream they’ve lost a lot of that. Have you written any other pieces on the subject? I’d be interested to see them! That’s actually an interesting story. Scotty, the editor in chief, and I met on Twitter. We have become really good friends and based on my novel, asked me to write for TAPS. I’ll be a regular contributor to the magazine. My next article will be on critical thought and the need for it the paranormal community. Sadly, I haven’t written any more on the subject. I’m giving a talk in February on Sacramental horror and I’m hoping to expand my thoughts. 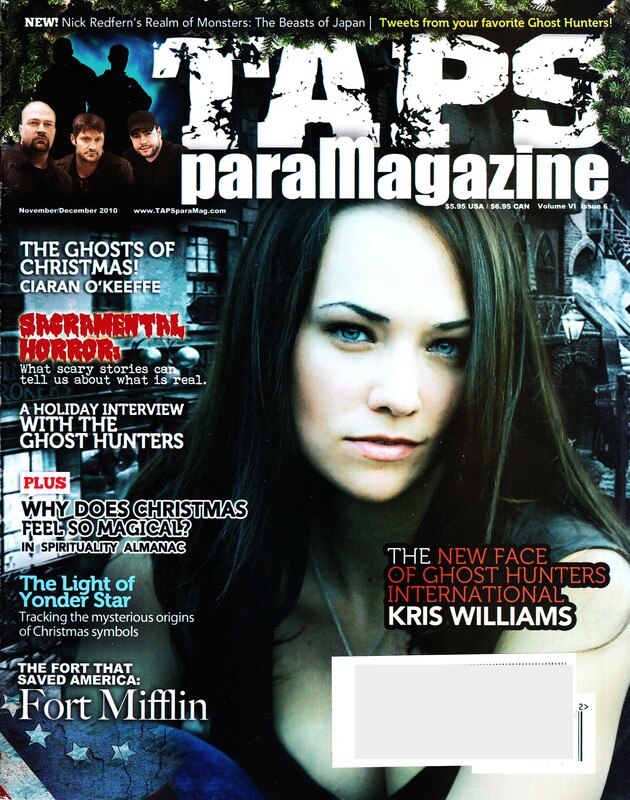 As for TAPS, I wonder if some of the move away from the religious aspects has to do with certain unnamed paranormal shows that shove it in your face in the most absurd ways. Don’t know, but I’m taking a guess….